CORTE MADERA, Calif.--(BUSINESS WIRE)--Dec. 6, 2018-- RH (NYSE: RH) announced today the opening of RH Yountville, an elegant wine country compound featuring an indoor-outdoor restaurant where guests dine under a soaring glass roof surrounded by 100-year-old heritage olive trees and sparkling crystal chandeliers, while listening to trickling water from dramatic seven-foot fountains. Located in the heart of Napa Valley, the five-building compound also includes a two-story stone Wine Vault at the Historic Ma(i)sonry Building, an outdoor Wine and Barista Bar, and two boutique design galleries – all connected by lush garden courtyards with outdoor living rooms that can be reserved for wine tastings, century-old French limestone fountains, globally-sourced antiques and artifacts, a 40-foot, live-edge single slab tasting table, fireplaces, and walking paths with decomposed granite and bluestone pavers. A first-of-its-kind integration of food, wine, art and design, RHYountville marks Chairman and CEO Gary Friedman’s ongoing collaboration with celebrated restaurateur and Founding President of RH Hospitality, Brendan Sodikoff, and award-winning design architect James Gillam of Backen & Gillam, recognized as one of Architectural Digest’s Top 100 architecture and design firms in the world. 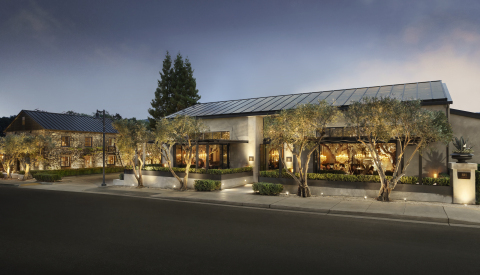 “RH Yountville reflects our vision for creating inspiring spaces and authentic experiences that respect and amplify the local culture,” commented Gary Friedman, RH Chairman & CEO. Guests will enjoy Sodikoff’s seasonal, ingredient-driven menu sourced from neighboring farms, which features a selection of shareable boards such as Artisanal Prosciutto with garlic bread, Délice de Bourgogne Cheese with warm baguette, Raw Vegetable Crudité with buttermilk herb dipping sauce, Crispy Artichokes with roasted potatoes and rosemary aioli,and Avocado Toast on grilled sourdough.Salads include Italian Burrata with roasted tomatoes, Shaved Vegetables, Gem Lettuce, Arugula with shaved fennel, and a Kale Caesar. Mains include the Half Roasted Chicken with olive oil potato puree and natural jus served in a copper roaster; the Atlantic Dover-Sole with brown butter, lemon and parsley; a 14-oz Charred Ribeye Steak with house-cut fries and aioli, and Broiled Salmon with honey, black pepper, brown butter and lemon. The menu also presents Sodikoff’s elevated take on timeless classics – such as the RH Burger, a Truffled Grilled Cheese on rustic sourdough, the Shaved Ribeye Sandwich on charred garlic bread with au jus, and the RH Scramble with crème fraîche, avocado and chives, also available with fresh shaved truffles. "The Napa Valley has had a profound impact on the way I see the world," Sodikoff said. “I spent five years living in Yountville over two decades ago, and am grateful to return home to work on a project this inspiring, in a community that I have such fond memories of." Originally home to one of Napa’s first vintners in the early 20th century, the landmark Ma(i)sonry building has been beautifully transformed into a two-story Wine Vault with a 24-foot cedar ceiling, rough-cut fieldstone walls, luxe lounge seating and a monumental limestone bar. By the taste, glass or bottle, visitors will discover a curated selection of rare, limited-production wines from some of the valley’s top small producers, as well as classic champagnes. Adjacent to The Wine Vault at the Historic Ma(i)sonry Building is a Wine and Barista Bar serving craft espresso, teas, fresh cold-pressed juices and wines by the glass. Sodikoff is also the founder, CEO and creative director of Hogsalt Hospitality, a rapidly growing restaurant group spanning 14 concepts and 15 locations. Hogsalt’s portfolio includes nationally acclaimed establishments Au Cheval, Doughnut Vault, Bavette’s and Gilt Bar, as well as his first restaurant in New York – 4 Charles Prime Rib, an intimate supper club in the West Village. Sodikoff has been named one of Chicago Magazine’s “100 Most Powerful People in Chicago” and one of Crain’s “40 Under 40.” He has also been recognized by Bon Appétit, Food & Wine and the Food Network, among others. RH Yountville is located at 6725 Washington Street and can be reached at 707.339.4654. Daily hours of operation are: Restaurant, 10am – 10pm; Ma(i)sonry Wine Vault, 11am – 10pm; Gallery, 10am – 9pm. RH (NYSE: RH) is a curator of design, taste and style in the luxury lifestyle market. The Company offers collections through its retail galleries, source books and online at RH.com, RHModern.com, RHBabyAndChild.com, RHTEEN.com, and Waterworks.com. This press release contains forward-looking statements within the meaning of the federal securities laws, including statements regarding the hospitality and retail experience offered by RH Yountville, including the Wine Vault at the Historic Ma(i)sonry Building, the outdoor Wine and Barista Bar, and the two boutique design galleries, and similar statements. You can identify forward-looking statements by the fact that they do not relate strictly to historical or current facts. We cannot assure you that future developments affecting us will be those that we have anticipated. Important risks and uncertainties that could cause actual results to differ materially from our expectations include, among others, general economic conditions and the impact on consumer confidence and spending; changes in customer demand for our products; our ability to anticipate consumer preferences and buying trends, and maintain our brand promise to customers; changes in consumer spending based on weather and other conditions beyond our control; risks related to the number of new business initiatives we are undertaking, as well as those risks and uncertainties disclosed under the sections entitled “Risk Factors” and “Management’s Discussion and Analysis of Financial Condition and Results of Operations” in RH’s most recent Annual Report on Form 10-K and Quarterly Reports on Form 10-Q filed with the Securities and Exchange Commission, and similar disclosures in subsequent reports filed with the SEC, which are available on our investor relations website at ir.rh.com and on the SEC website at www.sec.gov. Any forward-looking statement made by us in this press release speaks only as of the date on which we make it. We undertake no obligation to publicly update any forward-looking statement, whether as a result of new information, future developments or otherwise, except as may be required by any applicable securities laws.